If you´re searching for a cost–efficient and convenient way to develop your e–commerce website, look no further. ProWeb Innovations web design services are exceedingly effective in helping clients sell more from their online stores. As a partner of Bigcommerce, a leading e–commerce platform, we are proficient in building websites that generate consumer interest in the online universe. When we help you set up an online store using Bigcommerce, you will be given a securely hosted website, shopping cart and catalog for products. With the easy to understand analytical reports, you can easily track your financial progress. The user–friendly e–commerce development software also allows you to manage your online orders and inventory efficiently so that you can continue to sell items without skipping a beat. The online e–commerce solutions provided by Bigcommerce coupled with our design services will put you on the road to success. We will provide custom HTML coding for your website design if you decide you need it. With our expertise in web development, we can help you create an attractive and eye–catching online store. The aesthetic of your e–commerce store is as essential as the user interface, and we will work hard to design a fully professional site. When it comes to e–commerce store development and management, we provide a variety of options. If you are new to the industry, we can offer total administration assistance. For the more experienced business managers, we will set up the website and provide training so that the managerial duties are in the hands of the store owner. 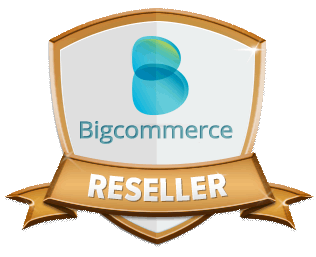 Bigcommerce also provides SEO tools for its clients, so you will easily be able to manage your visibility on the Web. If you use our e–commerce development services, your store will be fully functional in very little time. You don´t need experience in running an e–commerce website, and your data will always be secure. Once the design stage is complete, you can utilize the variety of marketing tools offered by Bigcommerce and get noticed on search engines and social media websites. With your online presence optimized, you will be able to run a successful store. Free trial e–commerce shopping carts are available by filling in your contact information below and requesting one, ProWeb Innovations will be happy to create a trial account for you to see how the front–end, and administrative section looks. Fill out the form and I´ll get right back to you. Enter your phone number in 123-456-7890 format! Connect and share your thoughts with me on these social networks.